Cerro San Cristóbal is a 2,752-foot (860m) hill rising above central Santiago which, on a clear day, affords magnificent views of the surrounding city, all the way across to the Andes. The easiest way to the top is by funicular, but there is also a teleférico (cable car), bus or hiking path leading up from the bottom through the forested slopes. 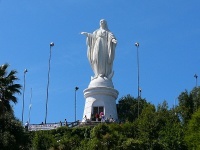 There are many walkways and at the summit is the 70-foot (22m) high statue of the Virgin Mary to mark where the Pope held a mass in 1987. There is also a zoo on the lower slopes, and picnic sites and two outdoor swimming pools spread throughout the park. The hill is situated within Santiago's biggest open space, the peaceful Parque Metropolitano; it makes for an escape from the hustle of the city. Visitors need a few hours to enjoy the park and on a sunny day the swimming pools are a delight.